Download a PDF of this Backgrounder. David North is a fellow at the Center for Immigration Studies; Rodney S. North is a Washington-based public policy analyst. The authors are grateful to the many people who helped with this project, including our CIS colleagues Jamie Greedan, Bryan Griffith, and John Miano; to Donna Desrochers and Joseph Grandinetti, and to a Northern Virginia activist who chooses to remain nameless. Used their status as IRS-recognized charities to avoid substantial state and federal taxes. Despite its name, there is no training involved in the OPT program; once a tiny and sensible operation, it was expanded beyond reason by both the Bush II and Obama administrations. OPT currently not only provides work permits for up to three years (formerly 29 months), it also gives employers a 7.65 percent tax break for hiring alien workers rather than American ones at the same salary because there are no payroll taxes levied on the former as there are on the latter. Creating the broader set of problems described above is a group of marginal institutions that used to be blessed by a lax accreditation agency, the Accrediting Council for Independent Colleges and Schools (ACICS), but lost that fig leaf when ACICS, after a long, formal inquiry, was de-recognized by the U.S. Department of Education (DoEd) in December 2016. This left some 55 institutions with well over 100 campuses in limbo, still largely able to issue the Form I-20 that aliens can use to apply for an F-1 (foreign student) visa, but with no U.S.-recognized accreditation and virtually all with one or (usually) more of the collection of eight black marks noted above. This Backgrounder reports on these 55 institutions, the very dregs of higher education in this country, the Compromised Colleges. They rarely offer first- or even third-rate educations, but all still have the power to admit foreign students. The report's four parts cover: the admissions process for foreign students; the characteristics of the 55 institutions; the impact they have on various aspects of American life; and conclusions and recommendations. Before we examine the behavior of these institutions and the results of their behavior, it may be useful to review how the United States screens foreign students, which, in turn, creates the setting in which the Compromised Colleges operate and, all too often, flourish. That there will be no governmental, stateside review of potential foreign students. Two agencies are charged with managing this activity, one that virtually never sees a student and one that (at least fleetingly) sees all the students. These entities are the Student and Exchange Visitor Program (SEVP), which is a subset of Immigration and Customs Enforcement (ICE), a part of the U.S. Department of Homeland Security (DHS), and the U.S. Department of State, whose consular officials interview the students overseas and determine whether or not to issue the student visas. Some foreign tourists adjust their status to that of students while in the United States following an interaction with DHS. The SEVP headquarters are separated from the rest of DHS by the Potomac River and even by government standards it is a remarkably sleepy agency, as we will demonstrate.2 That agency, in effect, licenses some 8,000 institutions (including various high schools and prep schools, as well as places that teach horse-shoeing and hairstyling), giving each and every one of them the right to issue the I-20, the DHS-sanctioned document that can lead to an F-1 visa. Thus there is absolutely no centralized, state-side review of which aliens are coming to the United States, and which are not. The only real rigor in the foreign-student screening system, and this is highly uneven as it is spread across the world, comes from the visa officers who are forced into the role of de facto collegiate admission officials. 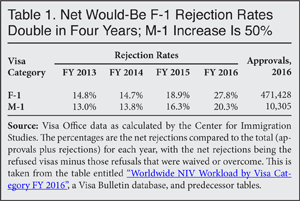 While I have not seen anything in writing on the subject, these officers must sense a growing amount of fraud in the foreign student process, as their rejection rate of F-1 applicants has doubled in the last four years, while the rejection rate for the much smaller M-1 category (vocational students) has increased by only about 50 percent (see Table 1). It should be noted that these trends have nothing to do with any Trump administration policy of restraint on migration decisions; during all four of these years the Obama administration was in charge. If one of the concerns is terrorists coming to the United States on student visas — and they have — the interview with the visa officer and the operation of the "don't fly" lists are our only protections. All of the rejectees, it should be noted, had been accepted by some American institution. That the visa rejection rates are so high is not a compliment to the way we as a country handle the foreign student program. The State Department and SEVP both deal with two different visa systems, one much larger than the other. The big one is the F-1 visa for academic students (as well as small numbers of F-2s for their spouses and children). The smaller one, by an average ratio of about 50:1 each year, is for the M-1s and M-2s.3 Virtually all of the foreign students attending the colleges of concern are F-1s. In contrast to the casual American system of assessing applications for foreign students, there are the British and Australian examples. Krishna's Path. Let's step back from this institutional analysis, to see how the whole system works from the point of view of one imaginary alien applicant. We will call him Krishna. We are using that name because a high percentage of the alien students in these 55 entities seem to be males from India. The largest group of foreign students in America, generally, are from China, but students from that country seem to be less likely to attend the marginal schools than are people from India. Neither Krishna, nor the institution he will join (we will call it Uncle Sam University) are typical of foreign students or of the U.S. colleges. Both belong to shady elements that one hopes are thoroughly atypical of the educational scene, but significant enough to merit much more attention than they are now getting. As a recent graduate of one of his country's colleges, Krishna already knows a lot about American higher education; he senses that he could not get into a first-rate U.S. school, but also gathers from his friends and relatives that there are numerous institutions, at all conceivable levels of quality. As part of his pursuit of a student visa he taps into both the webpages of potential schools in America and social media sites maintained by and for Indians thinking about attending an American colleges.6 He seeks information on the acceptance levels in the potential schools, which he wants to be high, and costs, which he wants to be low. Krishna, however, has a specific problem over and above school selection. He, like many in his country, has secured a three-year bachelor's degree. He wants to join a master's-level program because that would allow him, in many places, to have a legal job immediately through the OPT/CPT program. But to get into an American master's-level program, one must, typically, have a four-year bachelor's degree; further, one cannot use a first semester of an undergraduate program to obtain legal part-time work through CPT (Curricular Practical Training), a DHS-sanctioned work permit program for foreign students. And Krishna does not have enough money to spend a full semester in the United States without a job. He has two options: The legitimate one is to engage in a year's worth of education in India before coming to the United States; many people do that, but he is in a hurry. So he turns to the second option of getting someone in India (or in the States) to create forged documents indicating he has completed four years of post-secondary education in his home country. He knows that there are places in the United States that will accept his paperwork without examining it, on the grounds that they want his tuition payments. He finds someone in India to do the counterfeiting for a price he can afford and obtains the needed documentation. Thus armed, he continues his search. He is particularly interested in two aspects of any potential U.S. school: What are the up-front fees and first-year costs of the place, and how quickly can he get access to employment while studying at the school in question? The job opportunities for low-rated American schools (unlike those related to better institutions) are mostly off-campus and require an easy-to-obtain college approval through the aforementioned CPT program. Krishna is again aided in his search by the internet; there are India-based websites that deal specifically with institutions that offer first-day CPT and others that focus on the all-important visa interview.7 Krishna also secures a phony bank statement that exaggerates his net worth, so that he can assure the visa officer that he has enough money to get through his period of U.S. education. Krishna finds an American institution that will accept him and his forged papers; let's call it Uncle Sam University (USU). It promises that it will give him instant access to CPT. He sends them a money order and USU sends him a DHS form I-20. Krishna then reports to USU, fills out the university's forms, finds a place to live, perhaps in a USU dormitory, gets his class schedule, and, since he is a master's student, the university gives him CPT status immediately. He soon starts classes, always on weekends or evenings, and starts to work full-time at a pizza chain with a tie to USU. That this job has nothing to do with either curriculum or training is of no significance. He soon learns that he does not really have to attend the classes, but does have to keep up with his tuition payments, or else USU would, he gathers, report him to immigration authorities. Now let's turn to how Uncle Sam University obtained the I-20 power that it used to cause Krishna's admission to the United States. Uncle Sam University's Path. USU had to overcome two hurdles in order to secure the right (along with thousands of other institutions) to issue the I-20. The first was to secure a license to run an educational system from the state in which it wanted to operate. In some states, this requires little more than the completion of an application and the payment of a fee. In others, licenses are more difficult to obtain. This is a variable that should be studied in a separate effort and must play a crucial role in the state-by-state distribution of these colleges, a subject to which we will return. The second step, once a state license was obtained, was to secure certification from SEVP to issue the I-20. An application (the I-17), a ridiculously low fee $230, and supporting documentation are required; the applicant must assert, among other things, that the school has a state license and is, in fact, in operation. But the strange thing is that, with certain exceptions, an issuer of the I-20 need not be accredited by any organization recognized by the U.S. Department of Education. Most educational organizations are accredited. This loophole — not requiring schools seeking alien students to be accredited— seems to be more of an oversight than something that Congress did deliberately. The loophole, for reasons spelled out in this report, should be closed immediately. 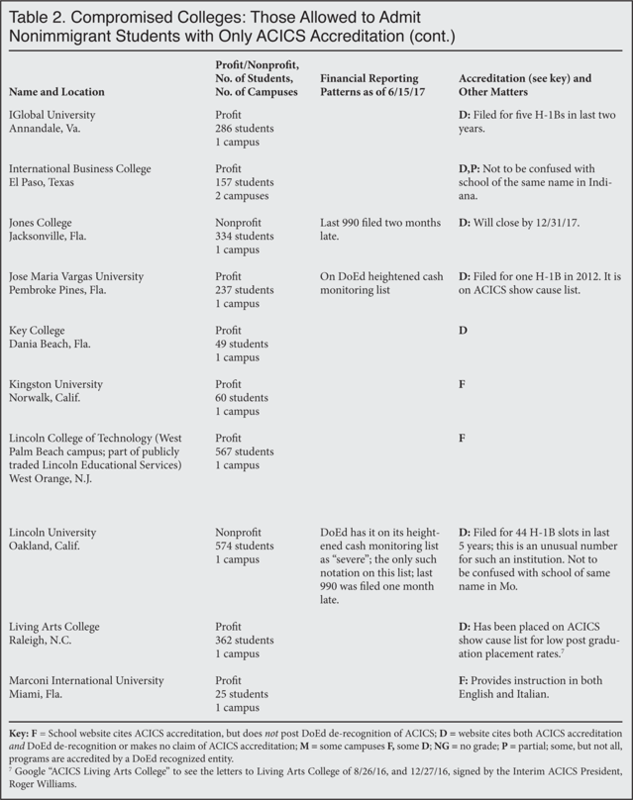 This evidence consists of three or more letters sent to the applying institution from accredited schools saying that they have accepted transfer students from the applying institution and have accepted its credits. In terms of public policy, this is decentralization gone crazy. With evidence in lieu of accreditation, neither a government agency nor a non-government accreditation agency licensed by the government makes the judgment; instead, educational entities selected by the organization seeking the license do that work. Do states hand out driver's licenses based on judgments of applicants' driving skills rendered by the applicants' best chums? Uncle Sam University chose the Accrediting Council for Independent Colleges and Schools (ACICS). USU filed a number of papers, paid fees of at least $6,000, experienced a once-over-lightly site visit, and secured the approval of the ACICS board, which consists largely of leaders of other for-profit schools. So, as our story begins, Krishna has arrived at Uncle Sam University and has begun his life in the United States while USU continues to prosper in its chosen field. 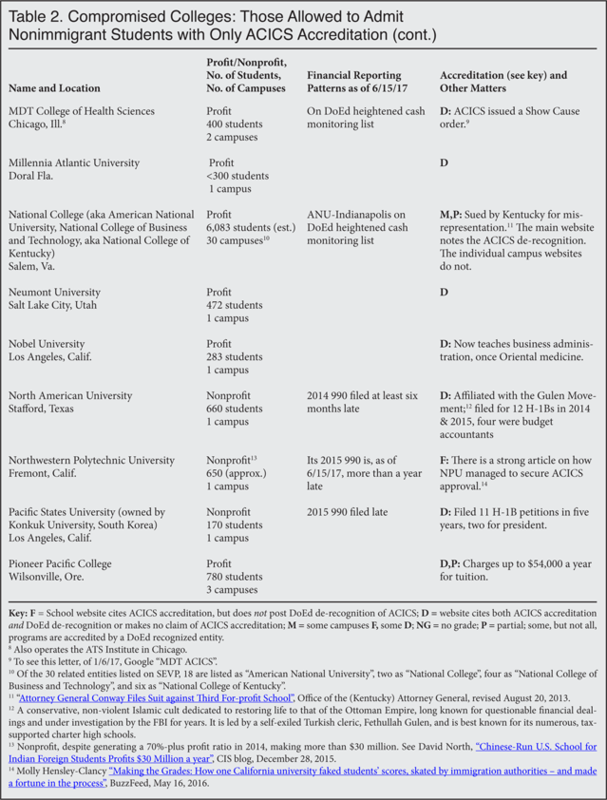 So what is ACICS and what role does it play on the foreign student scene? ACICS' Former Role and Its De-Recognition. ACICS is an old (founded in 1912), Washington-based, non-profit entity created largely by the for-profit portion of the educational system to accredit post-secondary schools and colleges, most dealing with career training. 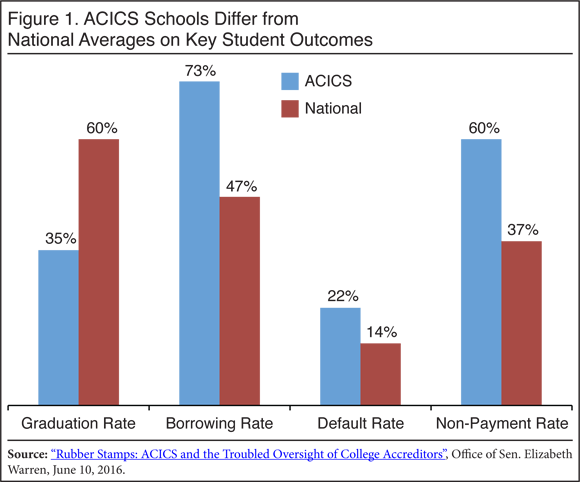 ACICS has come under fire in recent years because of widespread reports of low-quality education at its approved schools and their low graduation rates, high incidence of its student debts, and high non-repayment rates, as Figure 1 shows. Figure 1 is from a spirited, much-footnoted document from the office of Sen. Elizabeth Warren (D-Mass.) issued about six months before the Obama administration's decision to terminate the recognition of ACICS.14 The report is critical of DoEd's lax oversight of the oversight agencies, the equally lax oversight by ACICS of its schools (providing, for example, "honor roll" status for places about to be penalized for low standards), and the poor quality of education provided at high cost by the approved institutions. Interestingly, Warren's presumably pro-open-borders staff did not mention foreign students in the report. It gave students at the nonprofits among them more favorable access to slots in the master's degree part of the H-1B (nonimmigrant worker) program. There are two ceilings within the program: 65,000 for those with bachelor's degrees and 20,000 for those with master's, both of which are routinely over-subscribed. If one has a master's degree from an accredited institution, one may (as a potential worker-beneficiary) participate in both of the lotteries, first for the 20,000, and if unsuccessful there, for the 65,000. Given the withdrawal of ACICS recognition, the entities in question lost all four of these advantages. Of the four setbacks, perhaps the most interesting, and most convoluted, is the third. The loss of current accreditation by the schools does not directly restrict the issuances of F-1 visas to potential STEM students, nor does it cut off ongoing classes for such students. But it denies the two-year STEM work permit extension (under OPT) to those students who secure their degrees while their school lacks a current accreditor accepted by DoEd. Further, in cases where a nonprofit has provided a STEM master's degree to an alien, only a degree from an accredited institution will give the alumnus access to the portion of the H-1B lottery providing special opportunities to people with advanced degrees earned in the United States. It would be much simpler if the lack of accreditation cut off all foreign students in a black-or-white manner. Given this background in governmental policies and procedures, we now turn to a more detailed look at the colleges of interest. Overview. It is well known in U.S. higher education that most institutions are either governmental or genuine nonprofit entities. Schools are spread around the country much as the population is (i.e., they are scarce in Wyoming and numerous in New York), the presidents of these places do not own the institutions they preside over, and most of the students are residents of the United States. Further, these post-secondary entities can be found in both warm and cold climes. None of these statements hold true for the 55 colleges of interest. In addition, of course, most institutions of higher learning do not have accreditation problems, which is something that characterizes all 55 in this group. Defining the Compromised Colleges. There is no agreed-upon list of institutions that may be preying on the immigration system, just as there is no list of potential Nobel Prize winners or potential bank robbers. But we can assemble a list of schools that have the characteristics that suggest some of them may engage in immigration abuse. 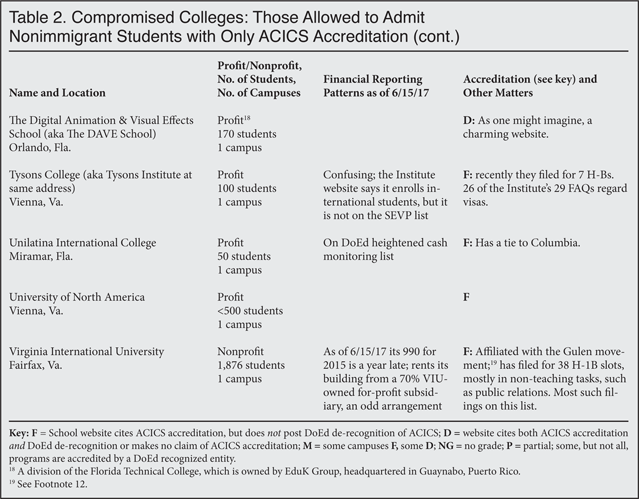 With that in mind, we have termed the worrisome group the "Compromised Colleges", and defined them as those that, as of June 15, 2017, had the power to issue the I-20 and were known to be accredited solely by ACICS, the agency de-recognized by the DoEd. This definition is used in Table 2 and throughout this text. At the other end of the spectrum, our list includes such entities as the Beverly Hills Design Institute, which appears to have 17 students and cannot have much of an impact on the immigration scene. Similarly, it includes the DAVE (Digital Animation and Visual Effects) School, whose spirited website suggests that it highly capable in its chosen field.18 There must be others of this kind. We felt it useful, however, to have a grouping that was defined in an objective manner, and thus this list of 55. Interestingly, as this work began there were 66 names on the tentative list, but several went out of business and several others secured legitimate (i.e., DoEd-approved) accreditation. Not all in the latter group are sure to survive, however. One of them, Coleman University in San Diego, for example, recorded three- and four-million-dollar losses in both of its last two financial reports. There are other complications: In at least one case the college is on the SEVP list, but the school's website indicates that it accepts foreign students on a campus not listed by SEVP; in several others, SEVP regards schools as active, but they, in fact, are either closed or in the process of closing. 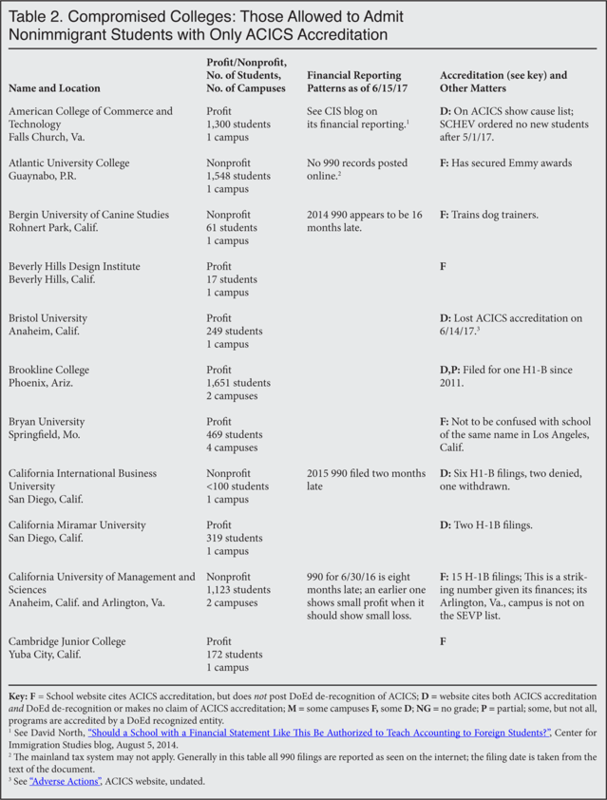 The annotated list of the Compromised Colleges (Table 2) shows, in alphabetical order, the names and the principal locations of each of the 55 schools; notes the number of campuses and the number of students at each; whether the college is for-profit or nonprofit; and provides brief summaries on financial reporting characteristics, accreditation status, H-1B use, and other matters. Government officials can use the list that follows as part of the decision-making process as they, one hopes, think twice before granting benefits to this tiny minority of 55 institutions (among 8,000 DHS-recognized ones), issuing visas to their prospective students, or granting H-1B status to their potential employees. Summarizing the data in the table, and from other sources, we now turn to a group portrait of the Compromised Colleges. The typical Compromised College is located in an office building, often shared with other businesses; most of these colleges are renters, not owners of the structures they use. They are far more likely to be in an urban or suburban setting than in a rural one. The first one we ever visited was in the D.C. suburbs. The now-defunct University of Northern Virginia had a modest suite of offices in the English basement of a tattered office building in Annandale, Va.; it had one visible classroom within the suite, and three other classrooms upstairs. If there was a library, we never found it. This school was at the outer edge of Compromised College minimalism despite the hundreds upon hundreds of OPT work permits it generated before the State of Virginia — not the feds — put it out of business. But the pattern of these institutions, beyond an attractive reception area in many cases, is to use a bare bones infrastructure. One each: Arizona, Colorado, Kentucky, Minnesota, Missouri, Nevada, North Carolina, Ohio, Oregon, Washington State, and Puerto Rico. If a college has more than one location, we list it in the state where it has its main campus or its corporate headquarters. It should be noted that none of the 55 are located in either Washington, D.C., the 33 remaining states, or in any of the other island territories. Most of the institutions are single-campus entities, but 18 of them have more than one location. Although the total number of campuses is a fluctuating number, we counted 119 of them as of June 1, 2017. As noted earlier, we suspect that part of the explanation for the geographic distribution is that some states have stronger control systems over private universities than others, and that the Compromised Colleges tend to operate in those states where the rules are the most relaxed. Just because an organization has convinced the IRS that it is a nonprofit does not mean that the leaders cannot be paid extravagantly, or that the president can't give jobs to lots of his or her relatives. Nor does 501(c)(3) status mean that huge profits cannot be made. We sensed no qualitative differences between the profits and the nonprofits as sub-groups, although one of the latter did appear to be a genuinely charitable institution. This is Shepherd University in Los Angeles. It is on our list because it has I-20 authority and because it had only ACICS as its accreditor for the school as a whole. On the other hand, it has legitimate partial accreditation for one of its nursing programs, it had $3,424,050 in grants and contributions according to its Form 990 for 2014, it has no negative marks from either the California Bureau of Private Postsecondary Education (as do three others on our list), or from the U.S. Department of Education (as do nine others), it does not mention ACICS on its webpage, and it pays its president, a lawyer, a modest $12,500 a year. The organization seems aimed at the Korean community, as it used to be in the Koreatown neighborhood of Los Angeles, and was founded by a man named Rhee. This outfit carries the same name as an unrelated and state-supported entity in Shepherdstown, W.Va.
NPU has another negative distinction — it is very hard to employ an indicted college president, as there are very few of them. But NPU managed to do this with Jerry Wang, then the former president of Herguan University (whose activities are described below), employing him during the period after his indictment but before he was sentenced to jail, as the institution's Form 990 recorded. Dr. Wang, after NPU hired him, pled guilty to immigration fraud. NPU and two other organizations, all nominal 501(c)(3) entities, might warrant audits by the Internal Revenue Service regarding their nonprofit status, which excuses them from 35 percent federal corporate profits taxes in all three cases, and from California corporate taxes of another 8.84 percent in two of them. Each of the other two has a specific financial reporting cloud over it. Being an IRS-recognized nonprofit and being in the foreign student business, does not guarantee financial success. The first three schools listed in Table 3 all operated at a loss for the most recent year reported, and in two of these cases, this was the second consecutive annual loss. (All the rest showed from modest to obscene profit levels.) One of the losing entities, Colorado Heights University, in Denver, though still on the SEVP list, has announced that it will go out of business in 2017. The nonprofits have two advantages over their more numerous for-profit colleagues and competitors, incidentally. Not only do they avoid corporate taxes, their alumni with master's degrees have a greater opportunity to secure H-1B visas, as mentioned earlier. The Presidents. Contrary to our image of U.S. universities largely being led by PhDs, the Compromised Colleges' websites show only 19 (about one-third) have either a PhD or an MD as president. In 25 other cases, the leader's level of educational achievement was below that level, and in 11 cases, despite our efforts, we could not get any information on the incumbent's education (see Figure 2). Among the nonprofits, the percentage of those whose presidents held doctorates was 46 percent, while among the for-profits it was 31 percent. The low incidence of PhD leadership throughout the group may be indicative of a non-scholarly approach to education. The one MD running one of these schools is Serif Ali Tekalan, a Turkish ear, nose, and throat specialist. Before he became the third president of the North American University in Texas (a Gulen operation), he was president of one of the Gulen universities in Turkey, the now-closed Fatih University of Istanbul. Similarly, Isa Sarac, the president of the other major Gulen college in the United States, Virginia International University, was previously principal of London Meridian College in the UK, another Gulen affiliate. We were curious about the apparent national origins of the presidents because three of the five visa mills closed by authorities in recent years were led by people with Chinese names at institutions preying on (or conspiring with) groups of "students" who were primarily from India. An interesting combination. The fourth such entity, a smaller one, was largely staffed by people with Indian names. While the fifth was located in Koreatown, a neighborhood in Los Angeles. The first three were Tri-Valley University in Pleasanton, Calif., whose president, Susan Su, has a PhD in mechanical engineering; Herguan University in Sunnyvale, Calif., whose president, Jerry Wang, has a PhD; and the University of Northern Virginia in Annandale, Va., whose owner, Daniel Ho, has no initials after his name, but who owned three Chinese grocery stores. So when we conducted a survey of the apparent ethnicity of the leadership of the 55 schools, what did we find? Lots of Chinese? Lots of Indians? Not at all. There were only four Chinese, and, as far as we can tell, no one with an Indian name. Nine of the leaders had Hispanic names and another 30 had what appeared to be non-Hispanic European names (which may include some African-Americans); then there were five Koreans, the two Turks, a single African (from Sierra Leone), and one African-American. In three cases there was no information. The mix was probably not too different from what one would find in a big city phone book — if they were still being printed. Finances. The point of running a school that exploits the immigration law is to make money for those managing the operation. While it is impossible to tell exactly how successful most of the 55 schools are, because a majority of them are privately held and have no obligation to either stockholders or to governments to reveal their profit-and-loss statements, our sense is that one would not run such a school for any reason other than greed, and if it were not profitable it would be closed. To paraphrase the late Sen. Everett Dirksen (R-Ill.), $5.6 million here, $5.6 million there, pretty soon you are talking about serious money. The other three closed entities were apparently making substantial sums, but not at the $5 million level. None of the terminated operations, however, has done nearly as well as Northwestern Polytechnic University did in 2014. In that year, as noted earlier, its profit ratio was 72.7 percent. That was a profit of $29,148,422 on total revenue of $40,109,184, with 96 percent of the latter being program revenue (i.e., payments from students). The year before it made a very healthy profit at the familiar $5 million level on total revenue of nearly $13 million. Unfortunately, as noted in more detail below, we have financial reports for only 17 of the 55, a minority of the group. This includes the 12 of the 13 nonprofits shown in Table 3, and six schools reporting their finances to the State of Virginia, as shown in Table 4. Virginia International University is on both lists. We noted earlier that three of the nonprofits lost money, while nine of them were in the black. With the six Virginia schools, we find all with positive returns, but with the only nonprofit, VIU, having three times the profits of the other five combined. Although all of the Virginia operations were profitable, with net margins ranging from 8.0 percent to 40.7 percent a year, other elements of their finances followed varying patterns. One, Tysons Institute, spent a remarkable percentage of its money on its attractive suite of offices (one of the authors has been there); the owners of a place that teaches practical nursing, Global Health College, squeezed so much cash out of its bank account, $660,000, that it had only $8,000 in the bank at the end of the year; and the University of North America had more than $2 million in the bank at year's end, but reported no investment income. We found no state other than Virginia making public the financial reports from its private schools. Further, it might well be noted, while the reason for these schools' existence is financial, and while some of their financial arrangements are intriguing, their impacts on the nation's immigration policy and on its demography are of greater importance. What the Financial Reports Reveal About the Compromised Colleges. The first thing to note is that financial information of any kind is not available on 28 of the 55 entities, or at least we could not find it. They are mostly for-profit entities in states other than Virginia; similarly there is one for-profit in that state that has managed to secure a piece of state legislation excusing it from making financial reports, Stratford University. We do have a total of 41 bits of financial reporting information on the other 27 institutions, with more than one of these items applying to several of them. Does the data on the 27 suggest similar reports regarding the other 28? There are two answers to that question: 1) we don't know, and 2) we hope not. Let's start with two highly noticeable items from the financial statements of two of the 27. TO PROVIDE AN ADVANCE EDUCATION AND A HIGH TECHNOLOGY LEARNING ENVILROMENT THAT MOTIVATS STUDENTS. Most of the financial statements of the others on the list of 27 handle the language adequately, but many of them lack transparency or present other problems. All 12 of the mainland nonprofits were from months to more than a year late in filing their most recent income tax returns (Form 990) with the IRS. Nine entities had questionable enough financial reporting systems to cause the U.S. Department of Education to place them on its "heightened cash monitoring" list, which it applies to a small minority of the institutions that handle federal education funds (they are identified in Table 2). One of these nine heightened cash monitoring entries was marked as "severe" in the case of Lincoln University of Oakland, Calif. 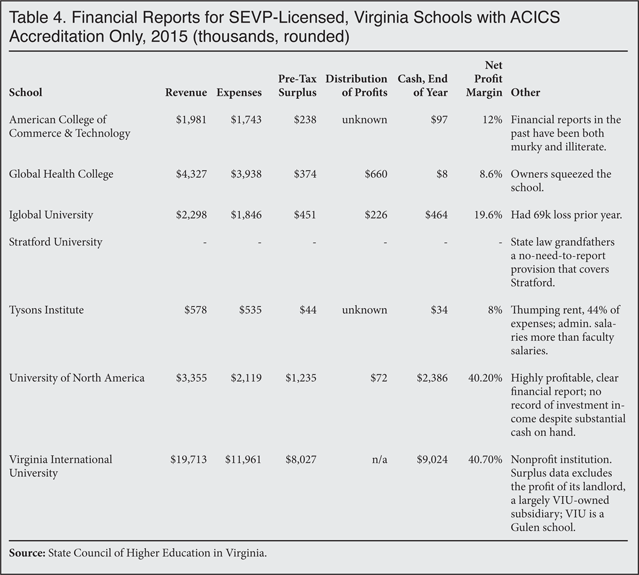 The recent financial reports of six Compromised Colleges in Virginia have been summarized in Table 4, and were discussed in the text. 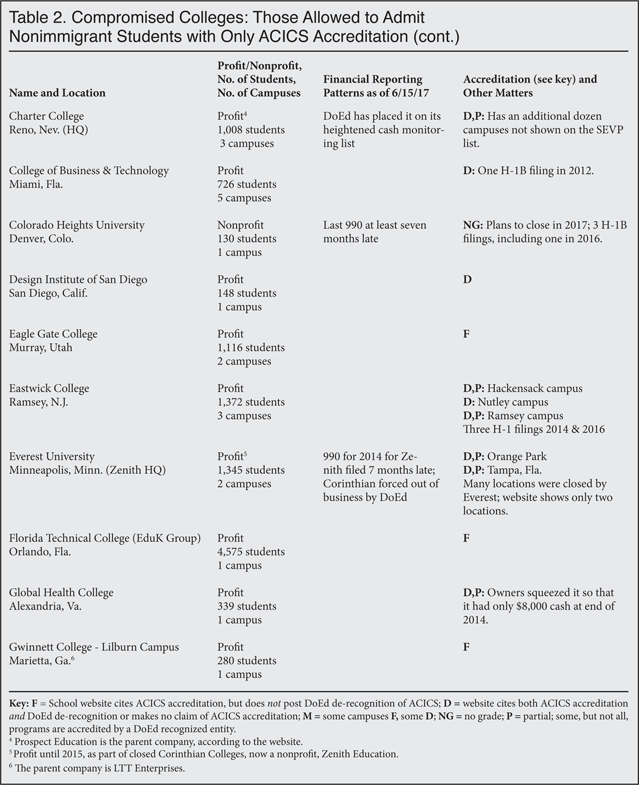 Two of the 55 schools are reported as subsidiaries of publicly traded organizations; one of these is Lincoln College of Technology (not Lincoln University), which is a relatively small operation within Lincoln Educational Services of West Orange, N.J.; the corporate report is similar to those of other large corporations, long and detailed; the corporation has lost about 75 percent of its value in the last five years. The other is Sanford-Brown College, the owner of which is Career Education Corporation, which announced more than two years ago that it is going out of business, yet on June 1, 2017, three of its campuses were still on the SEVP list. This leaves four more elements, each relating to a single institution. Shepherd University in Los Angeles, Calif., though previously noted as having some of the characteristics of a charitable organization, reported on p. 10 of its 2014 Form 990 an "all other expenses" item of $3,849,085, together with a "total functional expenses" of $8,813,766. When the "all other" items exceeds 10 percent of the "total functional expenses", the entity is supposed to list the components of the "all other expenses" in Schedule O of the Form 990; the university did not do so; neither did it explain an "other income" item of $3,816,673, an item that was in addition to substantial contributions and tuition payments. All this may be readily explainable, but it was one of several such mysteries we found in the 990s. We have already mentioned the remarkable levels of profits at Northwestern Polytechnic University and the strange presence of a partially-owned, for-profit subsidiary of Virginia International University, as its own landlord. There are, in short, many financial problems, and financial reporting problems among the 27. Are the financial patterns seen in these 27 Compromised Colleges typical of the whole set of 55? One can only wonder. 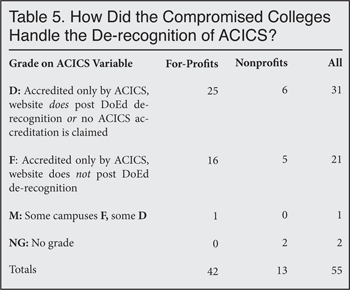 As to how the 55 schools handled the ACICS situation on their websites, they had two choices: 1) note the ACICS approval and the fact that ACICS was no longer recognized by DoEd, or simply not mention ACICS at all; or 2) record the ACICS accreditation and make no reference to the de-recognition on the website. The second choice is, essentially, crooked. These decisions are marked as D or F, respectively, in the Table 2 listings; in cases of multiple campuses, with some D and some F answers, we noted M for mixed; in a few instances we found no grade, or NG. It is worth mentioning, incidentally, that while we have financial information on only 27 of the 55 schools, we have accreditation description data on all 55, as all have websites. When we first looked at this evidence, in late April 2017, a majority of the entities took the low road and reported the ACICS historical approval, but not the non-approval of ACICS. By mid-June, the list had sorted itself down to 55 schools and some adjustments were made by some of the colleges. Table 5 shows the distribution. Schiller International University will be under the direct supervision of the U.S. Department of Education, which deems the institution to hold recognized accreditation and students will remain under the Federal Student Aid Program during the 18 months. Schiller does not elaborate on the nature of the "direct supervision of the U.S. Department of Education", which is, at the very least, an overstatement of the department's role in life. Perhaps we missed it, but saw on only one college website any indication that the current lack of accreditation eliminated the chances of an alumnus who earned a degree while the university was not accredited from securing access to the two-year STEM extension for OPT work permits.35 The impact on the students' chances of getting the STEM/OPT extensions should have been noted prominently on all of the sites, but perhaps that much brutal honesty about the institution's own failings is too much to ask. Turning from the characteristics of the Compromised Colleges, we will examine the collective impact that they are making on America. We will discuss what they do to immigration flows, the impact of their students (and their alumni) on the nation's labor markets (usually via the CPT/OPT program), the education they provide, and the financial costs to the students, as well as a brief note on how some of them, as employers, use the H-1B process. We will conclude this section with a description of the (limited) impact of government on these institutions. The Size and Characteristics of This Student Population. The most obvious impact on the United States of these schools is the continuing admission of a substantial number of nonimmigrants (mostly students with F visas, though some with M visas) to this country. How many are there? What do we know about their characteristics? The total student population of the schools, according to them, is 48,559, with a hard count available for 54 of the 55; we estimate 100 students at Tyson Institute, the 55th. Of these, 10,650 are in nonprofits, and the balance of 37,909, are at the for-profits. That was a snapshot taken in June 2017 and the tally three months earlier or three months later might have been quite different, as both students and institutions come and go. How does this total enrollment of approximately 40,000 foreign students as of mid-2017 compare to other measures of the broader international student population? Four sets of numbers, each defined differently, and for different time periods, are shown in Table 6. There is the annual tally by the Institute for International Education of international students in the 2015-2016 academic year, published in Open Doors 2016. This covers the enrollment in the more traditional universities and colleges and has only a small overlap with our population (though Lincoln University in California, and perhaps others, are covered in both surveys). The IIE survey provides totals both for all foreign students and for all foreign graduate students; again, this is for the places covered by their annual study, which is pretty comprehensive for the mainstream part of higher education. Then there is our survey of Compromised Colleges, with most of the foreign students probably being at the master's level. Finally, there are the new and interesting, but not really comparable, estimates of the Department of Homeland Security for 2016 overstays in the F, J, and M categories combined. On this last point, the DHS overstay report, only the second of its kind, is based on the government's own records, and is supposed to measure the difference between the number of expected departures in a given year (i.e., those whose authorized stay ended) and the actual total of recorded departures and recorded adjustments to another immigration status. It does not cover students from either Mexico or Canada, which is of little significance in this setting since relatively few students from these countries appear to be enrolled in the Compromised Colleges. The overstay report, as we noted earlier, indicates that foreign students as a group, are twice as likely to remain after their visas expire as nonimmigrants generally.37 This is a worrisome statistic. The suspected in-country overstays in Table 6 are those who entered this status during FY 2016. The total for all foreign student overstays still in the country after entering that status in previous years would, logically, be much larger than the 40,949 recorded. The DHS study is conducted in such a way that this larger grouping cannot be calculated. Returning to the rest of the numbers in Table 6, it is obvious that the Compromised Colleges enroll only a small portion of the nation's foreign students, something like 3 to 4 percent of them; that they probably have a higher portion of the graduate students than of all students; and that many, probably most, of the overstays must have attended the more traditional schools. On the other hand, it is likely that the Compromised Colleges make a larger contribution, proportionally, to the overstay population than they do to the current enrollment numbers. We do not know a lot about the characteristics of this population, but we do know that all are at least high school graduates and that most have some post-secondary education overseas, including a number of college graduates; we know that from the rules of the game. We also get the impression that most are from Asia, an impression that is supported by the just-mentioned DHS overstay report. We sense, further, from the let-em-all-in admissions policies of most of the Compromised Colleges that this is a not particularly gifted subset of the foreign student population and that, to the extent that these students are not dupes of the Compromised Colleges, they are co-conspirators with them, knowing that they are breaking (or bending sharply) our immigration laws. Further, unlike many refugees and many of those entering without inspection (EWIs), there is at least some money in their families: enough to pay the $200 visa fee, buy an airline ticket, and meet the initial financial demands of the Compromised Colleges. In short, they are neither the most poverty-stricken nor the best and the brightest of our many migration streams. We suspect that a non-trivial percentage of people like Krishna will remain in the United States in illegal status, which is one reason to worry about the role of the Compromised Colleges. The CPT part of the programs is presumably based on the very American concept of working your way through college. After the first year of undergraduate study, and from the start of graduate study, a foreign student, with the assent of the college's own designated service officer (DSO), may work full- or part-time on or off campus. Then, if the student does not use up 12 months of full-time CPT, he or she can get at least one year's post-graduate work in the OPT program, and two more years, for a total of three, if the degree is in the STEM fields of science, technology, engineering, and math, as many of the Compromised College degrees are. If the student has had one round of CPT/OPT and moves up the academic ladder, say from a bachelor's degree to a master's degree, then the whole CPT/OPT eligibility starts all over again. As a result, the norm is that the Compromised College student has either a full-time or a part-time job, nominally legally. Further, we gather that SEVP has interpreted the regulations on availability of CPT/OPT to those who move up to another level of study to say that any further degree, even at the same level, opens up another period of CPT/OPT. We heard of numerous discussions of foreign students seeking their second master's degree with that in mind. Several aspects of this labor market activity might be noted. In the first place, the impact is not concentrated in certain firms, as in the H-1B program, so it is not as noticeable and not so controversial. Second, a CPT/OPT worker is not indentured the way an H-1 worker is; he or she is free to use the work permit, the Employment Authorization Document, anywhere he or she chooses. Third, given the almost total lack of workplace compliance activity, the worker can cheat the system easily, working two part-time jobs and reporting one to the Compromised College, for example. So the adverse impact on the labor market is not dramatic enough to be noticed, and the issue of the payroll tax subsidy to the lucky employers has proved too complex for most reporters to either understand or write about. As a result little attention is paid to this matter. Remarkable Use of OPT/Stem Extensions. A few years ago four entities, three of which remain in business (Stratford, NPU, and SVU), together with the since-closed Herguan University, made a remarkable use of then-29-month OPT/STEM extensions. For the years 2009-2013, these four relatively small operations issued twice as many OPT/STEM extensions for their graduates as the eight Ivy League universities combined, according to data pried out of DHS in an FOIA request. The total number of issuances for this disparate set of a dozen institutions is shown in Table 7. These numbers, particularly those for Stratford alone, defy credibility and presumably were noticed by DHS because the figures for 2013 were considerably under those of 2011; for Stratford, the fall was from 458 to 207. We are seeking data for more recent years to see what has happened in this part of the OPT business. We have heard of the sale of OPT work permits, but have nothing substantial on that point. The Education Offered by the Compromised Colleges. There are a number of indicators of the quality of the education offered by the 55 schools. All had only ACICS accreditation for the school as a whole, and four of them were on the verge of losing even that. ACICS has, in turn, lost its power to accredit. For a few of the 55, the writing on their websites and elsewhere is not the best. Some of the other indicators are indirect ones; for example, most are for-profit entities, and most do not have people with PhDs as presidents. Further, some (such as NPU) have been examined by journalists with devastating results. A lot of school-specific unhappy social media comments have been made by students, former students, and some former staff members. And several of the 66 schools we started to examine some months ago have gone out of business. Many of the remaining 55 are in various kinds of trouble because of non-educational issues, usually relating to finances. The general impression is thus pretty grim. On the other hand, 12 of the 55 schools have picked up partial accreditation for one or more of their programs — such as acupuncture or nursing education — and six of 55 seem to be both small and specialized, a somewhat different model, and a less worrisome one than the rest. These six — and our selection is an admittedly arbitrary one — are Bergin University of Canine Studies, Beverly Hills Design Institute, Design Institute of San Diego, Seattle Film Institute, Shepherd University, and the Digital Animation & Visual Effects School. These six, by the way, have a total enrollment of 761, about 1.6 percent of the total of 48,579. We visited a similar institution a couple of years ago on a weekday. It was very quiet. The receptionist explained that all the classes were on Saturdays and Sundays. 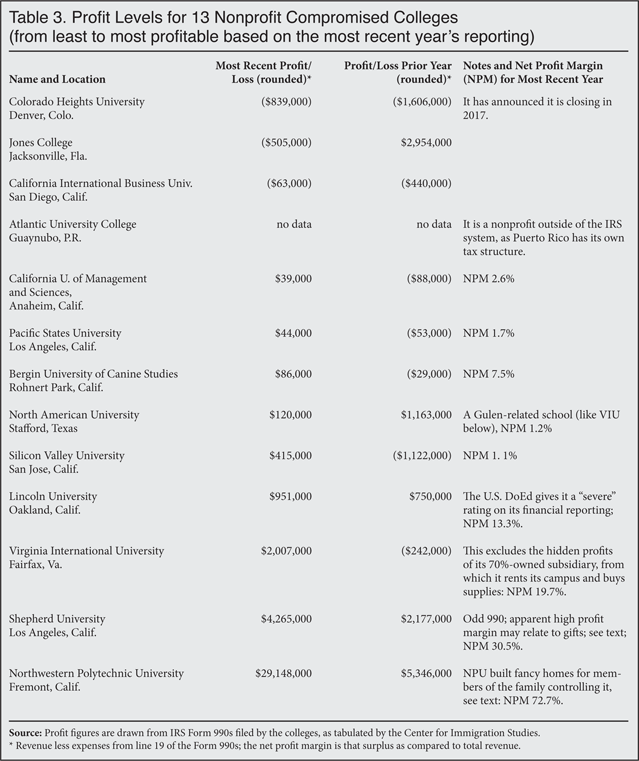 Use of H-1B Program by the Compromised Colleges. The Compromised Colleges are not at all compromised when it comes to their use of the H-1B program for skilled workers. As universities, they are not covered by the numerical ceilings imposed on private industry in this program. The H-1B nonimmigrant worker program allows for extended work periods by skilled alien workers, usually college graduates. The program has been widely criticized as lowering wages in the fields where it is concentrated, such as in the IT industries, and for shouldering aside available American workers in favor of less expensive foreign ones. It also can be used as an interim step on the way to permanent resident alien status by the worker in question, and most of its participants are from India, as most of the Compromised College students appear to be as well. So why do three of the Compromised Colleges feel they need this program that 44 of their peers never use? Incidentally, while the Gulen charter high schools routinely recruit teachers from abroad — usually but not always from Turkey — including some hired to teach English, the Gulen colleges tend to use the H-1B program to bring in administrators, including large numbers of managers, IT staff, and public relations workers. There would seem to be three motives here: hiring people that can be expected to contribute to the cause, hiring people actually needed at the schools, and creating work visas so that friends and family can come to the United States legally. The exact motivation, or combination of motivations, probably is different in different cases. What became of the university's effort to add one more president, or perhaps two of them, cannot be learned from the DoL database. No one at DoL apparently asked if the university really needs a part-time president, or two, to supplement the real one (who signed the application). And can one really hire such a person at $35.35 an hour, part-time? Full time, at 2,000 hours a year, the pay would be $70,700 a year. These problems would disappear if either DoL or USCIS simply defined a university for H-1B hiring purposes as one that has current accreditation from an entity recognized by the U.S. DoEd. Costs to Students. When reviewing the combined tuition and fees charged by the Compromised Colleges, the most interesting finding is that the large majority of the nonprofit schools charged 60 to 75 percent less than the U.S. national average for private, nonprofit, four-year schools ($33,480) as calculated in the annual reports of the College Board. Even the cost of the most expensive nonprofit school on our list, Shepherd University, is 40 percent lower than the national average. Overall the tuition ranges from $7,425 at Atlantic University (Puerto Rico) to $19,600 at Shepherd. We may guess that one reason for these low prices is an attempt to offset the schools' lack of strong, positive reputations. If indeed the tuitions are set low in part for marketing purposes, this would be consistent with our other findings around fees (see below) — a feature much less apparent to prospective students. The tuition charged by the 42 for-profit schools is much more consistent with conventional for-profit colleges. Combined tuition and fees range from $8,250 (Nobel University) to $35,000 (The Digital Animation and Visual Effects School aka DAVE School). The national average for tuition and fees at private, for-profit, four-year programs is $16,000, according to the College Board. Eighteen of the Compromised Colleges are priced well below the national average. Ten are approximately at the average tuition. Ten are above-average in cost, but aside from the technology-intensive DAVE School none are more than 60 percent above the average tuition. For both for-profit and nonprofit institutions, we found comparison shopping is difficult owing to tuition being presented in a wide array of formats (by the credit hour, academic unit, course, semester, or even by the full degree) and being published in differing places school by school. Even within one small school, Shepherd University (enrollment 295), there are 11 possible prices to acquire an academic unit, ranging from $200 to $1,598. At this time the Beverly Hills Design Institute does not publish its tuition at all. One concern with the Compromised Colleges is that not only are they exploiting a lax immigration system, but they are also exploiting the students and their families who are often footing the bills by hitting them with substantial and hidden fees above and beyond that of tuition. This is more than a matter of fairness and truth in advertising because when schools squeeze students economically they further incentivize students to seek employment, even while cutting into their studies (ostensibly the justification for their visas). Costs beyond tuition take multiple forms: high fees, hidden fees, extra fees imposed only upon international students, exorbitant withdrawal fees that possibly trap students in a program they would like to exit, exposure to unpredictable fee hikes, and deceptively low and unrealistic estimates for non-tuition costs that may lure students into arrangements that cannot later afford. For the foreign "consumer" shopping for a U.S. school the problem is compounded further because they are probably unfamiliar with the existence of these extra levels of costs. Just as colleges and universities of all types (from Harvard to Texas Tech) have been boosting their revenue in recent years by dramatically increasing the number, variety, and size of the fees they charge students, so have most of these Compromised Colleges. Bryan University charges $1,400/academic year for books for a BS degree — four times as much as other schools on our list for comparable degrees. Bryan also charges students a $645 annual "technology fee" plus a $600 annual "technology device fee". Brookline College charges a 4 percent student "loan fee" on top of the loan's 6.9 percent interest rate. California Miramar University charges all students a $1,200 "athletic development fee" per academic year, whether they are involved in athletics or not. At Virginia International University there is an extra 3 percent fee to pay with a credit card. A broad problem among the Compromised Colleges is the difficulty of simply finding the schedule of fees, especially for those speaking English as a second or third language. Atlantic University College and Cambridge Junior College do not post their fees anywhere on their websites. Charter College does not even post its tuition on its website. Others, like Brookline College and California Miramar University, bury their fees in 100-plus page catalogs, or separate addenda to the catalogs, that must be downloaded and searched separately. Even if the prospective foreign student does know to look there is absolutely no uniformity in the type or size of fees, nor where the information is posted, if it is published at all. Hence any meaningful comparison shopping is nearly impossible. Economists would describe this scenario as an "asymmetry in information". The consumer simply does not have the means to make an informed decision and consequently is vulnerable to being lured into a disadvantageous situation in a foreign country involving many tens of thousands of dollars. Even when fees are clearly posted they are subject to change. Some schools include this fact. Some include it only in fine print. Some do not declare this at all. A savvy foreign student might know to look for fees, but may not understand that as an international student he or she can face additional fees and or restrictive penalties. At North American University, international students face up to $660 in extra fees. At California Miramar University, an international student can face up to $1,880 in extra fees per year above what would be charged to a domestic student. For example, an F-1 student who withdraws before completing one academic year is hit with a $975 fee. At Stratford University, international students face a $1,000 fee to withdraw or transfer. We know this is not an inevitable expense. At the College of Business and Technology in Florida, the comparable fee is only $50. We know that most international students have very little money. Consequently these unexpected, and exorbitant, "exit" fees probably trap some in schools and programs they would rather leave. Effectiveness of Current Regulatory Schemes. How well are these regulatory systems working? In contrast to the 54 that have authority to accept new foreign students, with some of them leaving the field, there is a little list of five obvious visa mills that have been closed by the government in the last five years; in virtually all of those instances, these case-specific government operations took years to complete. And in many cases the visa mills kept grinding out more visas while the government pondered its next move. Our position is that closing a visa mill is not like sending someone to jail for a crime. No one has the God-given right to educate foreign students; that is a privilege granted by the government. The government should be more careful, much more careful, regarding what entities have this power. Meanwhile, there have been two positive, if partial, steps taken, one each by the Trump and Obama administrations, that have curtailed some of the activities of the Compromised Colleges. We will deal with the most recent move first. On May 23, 2017, the Department of Homeland Security issued a policy memorandum identifying a previously ignored ruling of a DHS administrative judge as a precedent decision. The decision said that for an H-1B candidate to make use of the preference for holders of U.S. master's degrees in the H-1B lottery, the university conferring the degree had to have accreditation from a DoEd-recognized entity.48 That decision was made back in 2013 and someone had to reach out to find it and cause it to be a precedent — an unusual, but creative, way to make policy. It caused the remaining ones to scramble for other accreditation, which some of them surely will not obtain. On the last point, Stratford University was, by June 20, 2017, telling prospective international students that it was not accepting any applications until it could work out the accreditation matter. Secretary King's decision makes it clear that a sweeping action, as opposed to one-case-at-a-time enforcement, is the better way to approach the problems brought to us by the Compromised Colleges. To balance that thought, here is another, more worrisome one: It is perfectly possible that the DoEd's ACICS decision might be overturned in the courts, which would restore these powers to the Compromised Colleges. That makes it doubly important that the government take other steps to control the these marginal schools, as we propose in the next section. We estimate that, collectively, the Compromised Colleges have some 40,000 or so alien students attending them right now. There may be something like a turnover of 20,000 a year, as new students arrive and old ones depart; many of those departing are either going into illegal status or will do so after a period in the OPT program. It would help if the government published data on the comings and goings of alien students by educational institution, but it does not. While detailed statistics on the aliens flowing through the Compromised Colleges are not available, we do have a good sense of the characteristics of these students and the alumni. They are young and have some college experience, including many with degrees, but their education has been of a low quality, particularly here in the United States. We also know that many of them sought out low-quality schools in the United States quite deliberately, as they were seeking paychecks, not valuable diplomas. They are not to be confused with anyone's idea of the "best and the brightest". Meanwhile, the group portrait of the Compromised Colleges is even more dreary. They, by definition, had only school-wide accreditation from ACICS, whose standards were so low that it lost its DoEd recognition. (At the same time, several of the least worthy of the Compromised Colleges were in the process of losing even that accreditation.) Many had financial reporting challenges and low marks from other regulatory agencies. So there is a strong argument to be made for seeking to reduce the roles of the Compromised Colleges or eliminating them from the foreign student business altogether. Stepping back a bit, and putting the Compromised Colleges into the larger framework for the need to reduce illegal immigration to the United States, generally, we would like to point out that moving against these institutions should be one of the easier decisions in this field. It is a vaccination, not open-heart surgery. No huge sums of money (as with the wall) are needed, no massive political forces (such as Silicon Valley's love of the H-1B program) need be challenged, and no mixed families of legal and illegal residents need to be separated, yet tens of thousands of new illegal aliens can be prevented from entering the county. In contrast, let's look at a single deportation case now before the Seventh Circuit Court of Appeals; the illegal alien father, who has worked in a pizza place for 18 years and has had numerous DUI convictions, is facing deportation. His wife is equally illegal and there are three citizen kids, including a baby needing special medical attention. Those are tough questions. The policy choices regarding the Compromised Colleges are a breeze in contrast. Shutting them down is not a deportation maneuver, it is a matter of preventing future illegal migration. No families would be divided. No one with close American connections would be disturbed. No major U.S. economic force would be threatened. It would be simply a matter of closing a gateway, a disreputable one, to the United States. Let's look at the specific ways that this could be accomplished. Proposal One: Eliminate the OPT Program and Narrow the CPT Program. There are many sound reasons for taking these steps that do not relate to the Compromised Colleges. OPT offers employers a subsidy for hiring recent alien college grads, rather than American ones, and serves as a handy little transition program between being an alien college student and securing H-1B status. In addition to the argument that the government has no business subsidizing the preferential hiring of foreign college grads rather than American ones, there is the fact that the generous rules for OPT and CPT are the main attractions of the marginal colleges. If there were not a legal opportunity to start work immediately (if one is seeking a master's degree), no alien would enroll at a Compromised College, and it soon would go out of business. The proposal then is to eliminate OPT, and to make CPT available for only 20 hours a week while classes are in session; it would also be available only after a full year of academic work had been completed. This would open up perhaps hundreds of thousands of jobs for American college graduates, as well as eliminating the Compromised Colleges. The only disadvantage of this proposal is a political one; it would stir up enormous opposition from employers and perhaps the universities as well. For better or for worse, there are other ways of controlling the Compromised Colleges, as shown below. Proposal Two: Bar Admission to All Alien Students Seeking to Attend Educational Institutions Without Current Accreditation from an Entity Recognized by DoEd. This would eliminate all of the foreign students on the rolls of the 55 entities we have been examining, a profound move in the right direction. It would force the 55 schools to recruit American students or go out of business. This would be a formal decision by ICE that only properly accredited colleges, perhaps with the exception of theological seminaries, would have the power to issue the I-20, or to cause the admission of J and M students. This is a much more modest proposal than the first one and it would be easier to achieve politically, but it is heavily reliant on the accrediting agencies, which might be tempted to award accreditation to other marginal colleges, as well as some in the current list of 55. With that in mind, Proposal Two should be joined by Proposal Three. Proposal Three: Create an International-Student-Dependent (ISD) Class of Educational Institutions. These schools would be non-governmental schools, and non-theological ones, with more than 50 percent of the students in nonimmigrant categories (F, J, and M). These schools would face more stringent rules than others. One of the rationales is that the students themselves will get a much better experience if they are not consigned to academic ghettos like the Compromised Colleges. 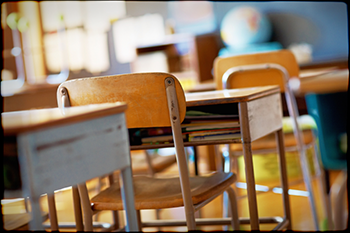 The schools would be required to pay independent auditors, selected by DHS, to monitor class attendance (presumably on a random basis) and to make certain that 90 percent of the class attendance took place during normal, Monday-to-Friday business hours. The faculty and the libraries would have to meet certain standards. The schools would be required, whether profit or nonprofit, to file financial reports (like the Form 990) with DHS, with certain items — such as percentage of gross income used to pay the faculty and the salaries of the president and other ranking officials — to be posted on the school's website. These financial reports would be audited, not just filed. The schools would also have to be accredited by a currently DoEd-recognized accreditation agency. As in the H-1B-dependent program, the objective is to discourage the establishment of such entities. In addition to these three basic proposals, there are some lesser but significant suggestions that could be used either as supplements or as (less attractive) alternatives to them. The agency handling the specific issue is identified in each case. ICE. Instead of abolishing OPT, restore the rules of 2001, for example, when a work period of one year was allowed each alien alumnus. There would be no STEM extensions. ICE. Instead of abolishing OPT, make it apply only to the alien alumni of the most distinguished 100 educational institutions in the nation, using some non-governmental peer ranking system. ICE. If OPT is to continue in something like the present form, which is not a good idea, see to it that it is a one-time only opportunity and cannot be extended, as it can be now, for successive degrees. Currently, one can use it for successive master's degrees, for example. ICE. Whatever else is done, SEVP should be more assertive in taking institutions off their master list of I-20 granting entities, once it is known that the place is closed or closing. One of the purposes of the list is to give visa officers information as to the existence, or non-existence, of the school that has created the I-20. ICE. SEVP announced some time ago that it had started to make site visits. These schedules should be arranged so that much more attention is paid to suspect schools than to long-established, innocent ones. These should always be unannounced visits. USCIS. Only appropriately accredited universities could have access to the university set-aside in the H-1B program. USCIS. If there is an category for schools dependent on international students, see to it that such schools cannot hire through the H-1B program. DOL. If OPT is to continue in some form, use some of the fees now available to the Student and Exchange Visitor Program to fund wage-hour investigators to check on the hours worked during the OPT/CPT program, as well as the wages paid to such persons. The concern would be students working too many hours and not receiving legal pay and overtime. IRS and ICE. All schools dependent on international students schools must file the 990, or other financial reports, on time or suffer a daily fee of 1/100th of 1 percent of the entity's net worth. That would work out to $100 a day if the net worth were $1 million. In a Better World. Finally, a bit of wishful thinking. IRS. Bearing in mind the error-filled papers currently submitted to government agencies by ACCT, NPU, and Lincoln University (Calif.), the filings of ISD schools would be examined by retired school teachers charged with viewing these reports as academic documents. When multiple errors occur, as we have reported from these three schools, the reports would be returned to the filing university, which would be given 30 days to file corrected forms. The errors would not be pointed out but would be recorded by the teachers. If 70 percent of the first-round errors were not located and corrected by the schools in a second filing, the daily fines would begin at the standard rate suggested above until at least 70 percent of the original errors had been found and corrected. These reviews probably would not be needed in the second or in subsequent years. 1 See David North, "Obscure Universities (One Now Closed) Got Far More OPTs than the Ivies", Center for Immigration Studies blog, January 31, 2017. For a history of OPT, see John Miano, "DHS Ignores Rules for OPT Visas", Center for Immigration Studies blog, March 12, 2014. 2The main offices of DHS are in the District of Columbia; SEVP is in Arlington, Va. Though the locations are just a few miles apart, the interactions among people in the smaller agency and those in the mother organization are far more limited than when, some 20 years ago, all of the elements of the old Immigration and Naturalization Service were in the same run-down building near DC's Chinatown. There was then much more formal interaction in the offices and, informally, in the cafeteria, for example, among all segments of the agency. 3 See "Annual Report of the Visa Office, 2016", U.S. Department of State, Table XVI(B). 4 See Richard Watson, "Student visa system fraud exposed in BBC investigation", BBC, February 10, 2014. 5 For a brief survey of that system, see David North, "Australia Ranks the Risks of Foreign Student Applicants by Nation of Origin", Center for Immigration Studies blog, February 2, 2016. 6 See, for instance, Redbus2Us.com and Happy Schools. 7 See, for example, Desiopt.com and Desi Studentz.com. "Desi" is an Indian term for expatriates; the names of the websites are good clues as to their content. 8 See David North, "Below Average Applicant Tells How he Got an F-1 Visa to Attend a Below-Average U.S. University", Center for Immigration Studies blog, January 12, 2016. 9 Scholars have done studies of the non-rational reasons for some decision patterns, including such seemingly trivial variables as the time of day. For more on that see Stephen Dubner, "How to Make a Bad Decision", a Freakonomics Podcast script, November 17, 2016, p. 13. 10 Decades ago, I conducted a study for the old INS of its air- and land-port inspection practices. Time and again, the inspectors I met at various places spoke of the "whole man" theory of the process. Did the person before the inspector seem to be consistent with what his papers said about him? Did his clothes, his language, his demeanor, and even his airline ticket fit with his overall story? As an example of someone who did not meet this test, I was told of an alien seeking admission at JFK who said he was a first-time visitor from Haiti who was dressed in the latest U.S. street manner, and who had an airline ticket (unknown to him) that indicted that he was returning to New York on a round trip. 11 See "Recertification Additional Evidence Guide for Non-Accredited Schools", U.S. Immigration and Customs Enforcement, undated. 12 See Fernanda Zamudio-Suarez, "Education Dept. Upholds Revoking of Embattled Accreditor's Recognition", Chronicle of Higher Education, December 12, 2016. 13 See "Letter to Students at ACICS Accredited Schools", HomeRoom, the Official Blog of the U.S. Department of Education, December 12, 2016. 14 See "Rubber Stamps: ACICS and the Troubled Oversight of College Accreditors", Office of Senator Elizabeth Warren, U.S. Senate, June 6, 2016. 15 There is an exception: Well after 9/11 DHS decided that flight-training schools (but not schools for other aviation work) need to have accreditation from the Federal Aviation Administration before they can accept foreign students. For more on that decision, see "SEVP Policy Guidance for Adjudicators 1207-04: Flight Training Providers", U.S. Immigration and Customs Enforcement, December 11, 2012. There are no flight schools among the 55 Compromised Colleges. 16 Most of the 39 schools, except those in Northern Virginia, are in the southern reaches of these states. On the other hand, of the 10 states with a land border with Canada, only two of them (Minnesota and Washington State) are the locations of a Compromised College. 17 See David North, "Virginia, Not ICE, Closes Suspect University of Northern Virginia", Center for Immigration Studies blog, July 18, 2013. 18 See the Dave School website here. 19 Similarly, the remarkable incidence of attractive blond young woman in these website photos is hard to believe, when most of the students are males from Asia. 20 See Molly Hensley-Clancy, "Making the Grades: How one California university faked students' scores, skated by immigration authorities – and made a fortune in the process", BuzzFeed News, May 16, 2016. 21 See, most recently, Margaret Brennan and Jennifer Janisch, "Are some U.S. charter schools helping fund controversial Turkish cleric's movement? ", CBS News, March 29, 2017. 22 See Randy Ellis, "State audit questions charter schools' site lease payments", The Oklahoman, March 17, 2016. 23 See "Federal Student Aid: Heightened Cash Monitoring", U.S. Department of Education, and its March 1, 2017, "List of Institutions on HCM as of March 1, 2017". 24 See, for example: David North, "One Visa Mill Owner Sent to Jail for 16 years", Center for Immigration Studies blog, November 7, 2014; and David North, "DHS Finally Takes Action Against Calif. Visa Mill", Center for Immigration Studies blog, January 12, 2017. 25 The case, in the federal courts' electronic filing system, PACER, is 2:12-mj-03083-JBC. 26 Mr. Shim has several PACER files; the quotation in the text is from 2:15-cv-07554-GW-GJS. See also Elizabeth Redden, "College Owner Pleads Guilty to Immigration Fraud", Inside Higher Education, February 13, 2017. 27 See Jason Molinet, "Founder of phony university that bilked millions from students and filed fraudulent visas gets 16 years", New York Daily News, November 4, 2014. 28 See David North, "Should a School with a Financial Statement Like This to be Authorized to Teach Accounting to Foreign Students? ", Center for Immigration Studies blog, August 5, 2014. 29 Further, the now-closed Herguan University left an illiterate and inaccurate description of its own graduation ceremony on its website for months, as we reported at the time. See David North, "Should DHS License an Institution Like This to Teach Foreign Students", Center for Immigration Studies blog, January 13, 2014. 30 See "Disciplinary Actions", California Department of Education, Bureau for Private Postsecondary Education, updated August 1, 2017. 31 See "Federal Student Aid: Guidance on Implementing the Net Price Calculator Requirement", U.S. Department of Education, February 27, 2013. 32 For more on this sleight of hand, see David North, "Should a School with a Financial Statement Like This to be Authorized to Teach Accounting to Foreign Students? ", Center for Immigration Studies blog, August 5, 2014. 33 See "Accreditation", Schiller University website. 35 The exception, which was not on a college website, per se, was a YouTube video, "Episode #006 Accreditation", showing Dr. Richard Shurtz, President of Stratford, discussing how his university was "on track" to get full accreditation. In it he does mention the fact that the OPT/STEM extension would not be available to international students. 36 SEVP has school-by-school totals, but will not release them except through the Freedom of Information Act route, which is heavily backlogged; the authors did not have the foresight to file a FOIA request a year or so ago. 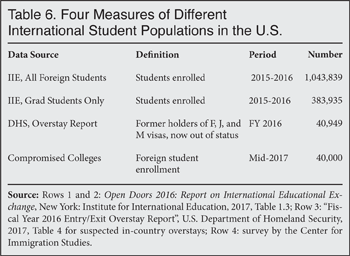 37 See David North, "Overstay Study Suggests Need to Overhaul the Foreign Student Program", Center for Immigration Studies blog, May 25, 2017. 38 We do not know enough about this report, and how it was constructed, to comment further, except to note that such a document has long been sought by Congress, and it has finally arrived. 41 See "Universities offering CPT from day 1", Admit School, April 30, 2015. 42 See Julia Preston, "Lawsuits Claim Disney Colluded to Replace U.S. Workers with Immigrants", The New York Times, January 25, 2016. 43 See the Vargas University ,a href="http://jmvu.edu/mba-in-finance" target="_blank">website. 44 See Margaret Brennan and Jennifer Janisch, "Are some U.S. charter schools helping fund controversial Turkish cleric's movement? ", CBS News, March 29, 2017. 45 The university's Form 990 for 2015 can be seen here. The text of the 990, which was signed by Dr. Brodsky, is sprinkled with grammatical and spelling errors, such as this discussion of the university's instruction in English, in the document's Schedule O: "The University services approximately 100 students and offer DBA degree. It also offers non-certificate, non-degree in general and intensive academic English preparation to support the students entering academic studies." 46 The full text of the university's first application for an H-1B worker to be its part-time president can be seen here. 47 See David North, "It Looks Like Visa Mill History Is About to Repeat Itself in Northern Virginia", Center for Immigration Studies blog, June 23, 2017. 48 See David North, "A First Small Step Toward Fixing H-1B", Center for Immigration Studies blog, June 1, 2017. 49 For more on this case, see Gerald Seipp, "Federal Case Summaries", Interpreter Releases, June 5, 2017, p. 23. 50 See Neil Munro, "Federal 'OPT' Program Rewards Companies for Hiring 330,000 Foreign College Grads in 2016", Breitbart News, June 21, 2017. The 330,000 figure tends to overstate a very real problem a bit. The government, outside the Census Bureau and on some health care issues, rarely calculates the size of an impacted population; what it does is to release workload data. The 330,000 is not the population that, at any one time in 2016, was working with an OPT permit, it was the total number of people who had one or more days of that work permission during the year. The average figure would be tens of thousands of jobs lower than the 330,000, but still at a very worrisome level.